This is located in the Beulah* community on the Wilkes-Lincoln County line. Thanks to Ricci Rhodes Cameron and Randy Rhodes for the identification. Ricci writes, via our Facebook page: It was originally Beard Grocery. My great-grandfather started it, and my grandfather bought it, and changed the name to Rhodes Grocery. When it closed it was known as Ricks Place, owned by Rick Harper, a cousin. *Regarding Beulah: there are at least six communities in Georgia with the name and at least 57 in the United States. Love this part of state. Northeast Georgia. Please go through Elbert. Franklin, Hart, Stephens, Hatbersham. Clarke, White, Rabun, Banks, etc. We have great old buildings. Yes it’s in Wilkes County. It used to be owned by my ex-husbands grandparents. The Rhodes’ family. It was Ronnie’s Place not ricky’s owned by Ronnie Harper. 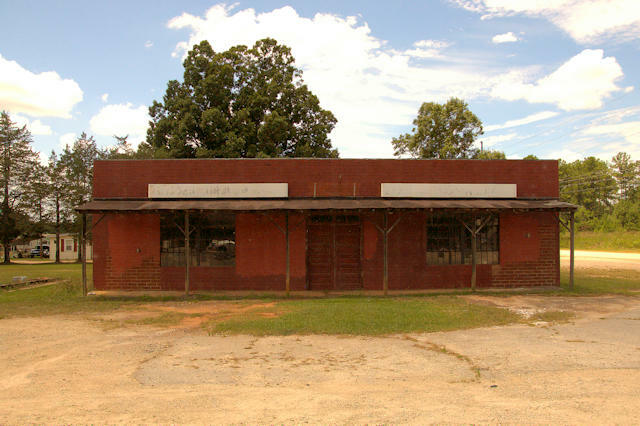 My granddaddy went there every morning to sit and talk the other men, we allways called it cousin Albert store. One morning when he did not show up the men went looking for him since he was like clockwork. He had had a stroke and they were able to call for help. It was allways a treat to go to the store and get candy and a drink. Stories like that make you proud to be from a small and caring community. Wonderful memory!